On the day she was born, Miranda’s mama started dreaming about the day her daughter would walk down the isle in the billowing white wedding gown. Miranda’s mama never had a wedding. She got married in a Vegas wedding chapel just a couple months before Miranda was born. Miranda is 27 years old. Her mama has been cherishing that wonderful white wedding dream for a long, long time and now that Miranda is getting married, it is time to make her dream come true … but it isn’t Miranda’s dream. Miranda and Victor have set their wedding date for February 14th — Valentine’s Day. Miranda has chosen a red velvet ball gown with black satin trim to be married in. Her mother is appalled. Apparently there has been much wailing, crying and gnashing of teeth. Miranda and her mother speak to each other only through Rena, Miranda’s maternal aunt. It is through Rena that I know this wedding war story. Apparently Victoria (Miranda’s mother) believes that a daughter has a big fancy wedding not for herself, but for her mother. According to Victoria, Miranda’s turn to plan a wedding and debate wedding dresses will come when Miranda’s daughter gets married. Obviously Miranda thinks her wedding should be her own — and she and Victor are paying for it. She is sorry that her mother’s dream isn’t her dream, but firmly believes she should be free to follow her own dreams and live her own life. At the same time, she does not want to hurt her mother. At this point Victor is all for eloping and just having the whole drama over. What started out as a Valentine’s Day Ball (apparently Miranda and Victor met in a ballroom dancing class at the college) for their friends and family with a brief wedding ceremony in the middle, has turned into a family battle ground revolving around white satin, church aisles and a priest. Rena has suggested what seems practical to me — but again, it is not my dream — a small church wedding followed by the Valentine’s Ball reception. 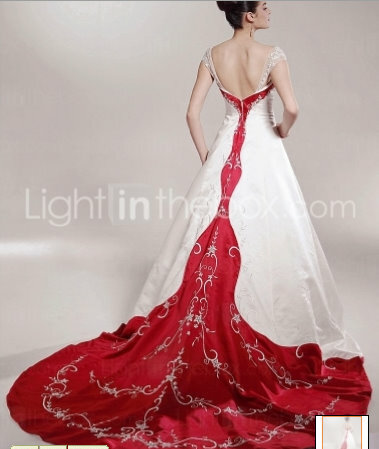 Rena has even come up with a stunning wedding dress that should suit both venues. What remains to be seen is if Victoria and Miranda will agree. I’m engaged right now and told my fiance I want to elope this year. I’d rather be outside in the mountains with a sweater and pants than in a wedding dress! Kala — I love the romance of formal weddings and have attended many that took my breath away, but it wasn’t what I wanted for myself, either. My daughter designed her dream wedding in a class last year on fashion design. She was VERY serious about the project and has a notebook about 4-inches thick filled with her ideas. How would Rena like her daughter to have a “redneck” wedding. Megan found an engagement ring that looks like a beer bottle cap (tastefully surrounded by diamonds), cakes with hunting and/or fishing themes (or made completely from Hostess snack cakes), camoflage gowns and tux’s…..just to name some of it. It’s not my cup of tea, but I agree….the wedding should be for the bride and groom. get rid of all of the Google ads all over the place which has happened. I’m later than you were for Haiku Wednesday. Too late in fact to even post one. I got married in winter so I decided to have my attendants (all two of them) wear long red velvet dresses. Not very Hawaiian, but it’s what I wanted. Art was paying for the whole wedding anyway so my mother couldn’t complain tooooo much. She didn’t like red because she said it was the color of passion and that passion was too hot and would die quickly. Ah well… We’ve been married 38 years and passion is just fine, thank you. If mom & dad are paying for it, then they should have some say in the matter. If not, then it is up to the bride & groom; however, it is nice to take notice of what is important to the parents. In Miranda’s case, perhaps a simple white dress for a simple wedding ceremony would please her mother (esp. if mama is willing to foot the bill), followed by a spectacular ballroom extravaganza planned and paid for by the bride and groom. There is no law that says you cannot exchange vows at both venues, is there?